The ‘‘Peel’ products range features high quality materials, excellent attention to details and a visually striking aesthetic. The range consists of three harmonious products: a Kettle; a Coffee Machine; and a Toaster. The Peel Kitchenware range has attracted significant interest from European retailers and manufacturers. The range is inspired by the ultimate alluring drop of coffee that simulates ripples which continue to flow through the stainless steel. This unique fluid design feature is not only aesthetically pleasing but helps the user locate their mug or decanter. The stainless steel is enhanced by glowing LED bands which reinforce the brands liquid origin and acts as an indicator, showing that the product is in use. A stark contrast between the satin matte black, fluid brushed stainless steel and soft glowing Blue creates an elegant and ultramodern brand identity. The main aesthetic centrepiece of this unique coffee machine is the elegantly crafted surface that reflects the ripples originating from ultimate alluring drop of coffee. The stainless steel hot plates are framed by glowing LED bands of soft blue light to indicate when the machine is operating. The perpendicular rear form sits impeccably within a kitchen environment and provides an optimum route for the internal piping structure to transports boiled water from the 1.5L removable reservoir. The main body of the kettle elegantly peels away to form the spout, cementing a clear design language throughout this range. 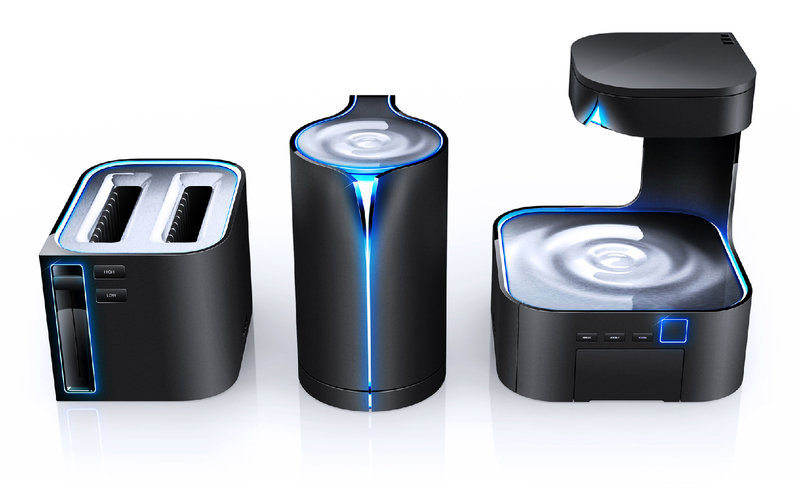 The lid comprising of a sleek rippled surface is hinged to reveal the water chamber. Both the lid and handle are crafted from pressed stainless steel encircled in a soft blue light. A continuous soft glowing LED band illuminates with colour to indicate when the kettle is boiling and subtly displays the water level. Intricate 3D lines seamlessly fuse the kettle through an unbroken jet black polished band to contrast with the satin matte body. The kettle boasts a 1750ml maximum water capacity, detachable base, auto-shut off and a flat stainless steel concealed element for fast boiling and easy cleaning. The core design DNA of the ‘Peel’ brand has been implemented throughout the toaster to seamlessly integrate it in to the range. The top plate is crafted from pressed stainless steel, with its edges falling away into a sea of soft blue light surrounding them. The toaster has large radii slots to cater for a wide range of bread types and thicknesses. The geometric profile creates a strong, visual bond between the toaster and coffee maker. The manual sprung level automatically activates the toasting process which is indicated by blue LED bands of colour around the stainless steel and leaver. Automatic shut off, toasting levels and a crumb tray have also been integrated into the design.